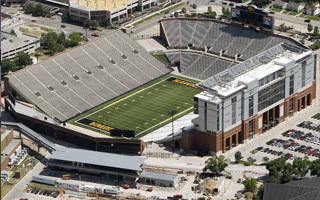 Kinnick Stadium is Iowa’s largest and most iconic football stadium and while Iowa isn’t among the largest states, Kinnick Stadium is quite large. With over 70,000 capacity, the stadium has a nearly 90-year history. It may also have a very odd tribute in architecture. Reed and Sandy Carlson from Decorah (some 180km or 110 miles north of the stadium) filed for planning permission to build a house resembling the landmark stadium. And, in a local scale, the house would also be landmark of sort. With almost 7,500 square feet (700 m2) it would be the largest house around. Some even fear it might serve other purposes than just residential. The building’s ground floor reportedly has one vast space for… tailgating. "I'm a big theme guy; I like themes," Carlson told the Press-Citizen. "When we originally got the lot in University Heights [where they attempted to build before Decorah], my stepson suggested 'If you're going to use it to tailgate, maybe you should build it so it looks like Kinnick Stadium,' and I thought that sounded like a good idea." Though it’s just a house, the building already received official statement from the University of Iowa, owners of actual Kinnick Stadium. The university claims there is no reason to obstruct such plans, with architectural copyright long expired. UI however had previously denied similar approval to a Harley Davidson dealership, arguing the commercial use was problematic. With local residents anxious about the “mini-Kinnick”, the City Council of Decorah will actually discuss the house next week.